Lake Tahoe is the largest alpine lake in North America. Located in the Sierra Nevada Mountains, it straddles the border of California and Nevada. Alpine lakes are found at elevations generally above 5,000 feet. Typically the water is much clearer than lakes at lower elevations due to the low water temperature which decreases the speed and amount of algae and moss growth. 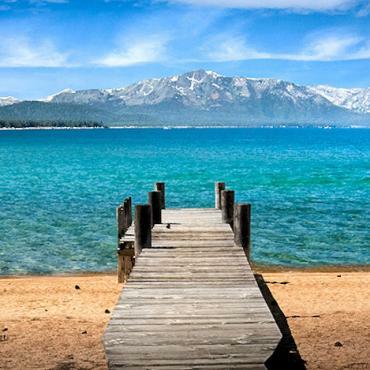 Lake Tahoe is also the second deepest lake in the USA trailing only Oregon's Crater Lake. The lake was formed about 2 million years ago as part of the Lake Tahoe Basin, with the modern extent being shaped during the ice ages. 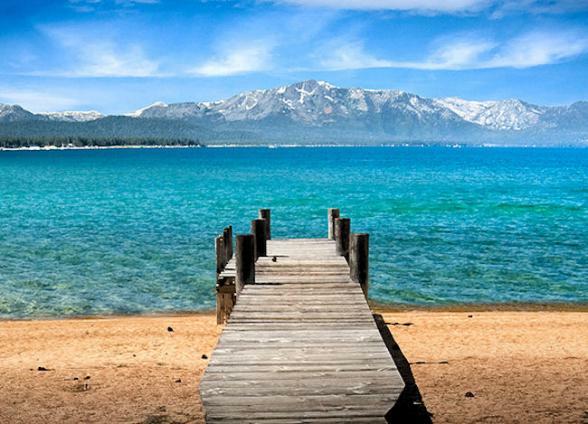 The area surrounding the lake is also referred to as Lake Tahoe, or simply Tahoe. South Lake Tahoe is right on the border of Stateline, Nevada and South Lake Tahoe, California. No matter the time of year, there is plenty to keep you busy. The Nevada side offers Vegas style casinos and entertainment. The California side, outdoor splendour. During the summer, hit the trails by bike or foot; explore by boat or simply relax in a seriously ‘away from it all’ setting. There are plenty of beachside restaurants, marinas and water fun with the most incredible backdrop of lake and the Sierra Nevada mountains. Get a bird’s eye view from The Gondola at Heavenly. Heavenly Ski Resort and Heavenly Village has plenty for skiers and those who prefer to do a spot of shopping or sip a little something whilst sitting in the sunshine or by a roaring fire. Winter is a skiers wonderland with slopes to tackle north and south, plus sledding, snowshoeing and snowmobiling. Emerald Bay, the only islet in Lake Tahoe, is home to the Scandinavian-style estate known. Tours are available during the summer months and the story of the property over the years an interesting yarn. 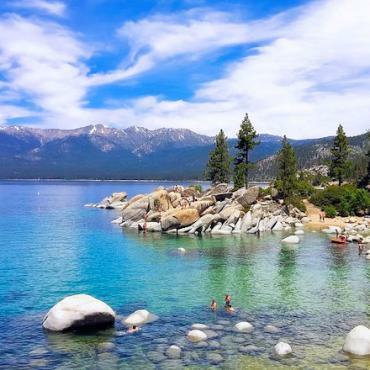 The north shore of Lake Tahoe, including Crystal Bay and Incline Village offers a 180 degree panorama that is as unique as it is beautiful. Scientists journey here to understand the water’s blueness and ensure that it remains an icon of pure alpine perfection. This entire area is awash with history as well. The Native American Washoe people date back as inhabitants at least 6,000 years. In 1844, American explorers Kit Carson and John Fremont were the first to ‘discover’ the area before the 1860s when silver was found in the Sierra Nevadas and the region prospered. Mark Twain – then Samuel Clemens, travelled to Lake Tahoe in 1861 and it completely changed him. He arrived with the idea of benefiting from the land but soon realised that the preservation of what Mother Nature created was more important. Lucky for everyone, Mark Twain wasn’t the only one. 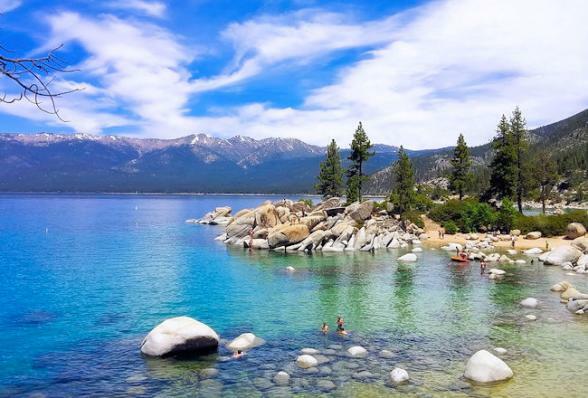 Today Lake Tahoe is little different from when Mark Twain dubbed it "the fairest picture the whole earth affords." In 1969, Emerald Bay was recognised as a National Natural Landmark. In 1994, California State Parks included the surrounding water of the bay as a part of the park which makes Emerald Bay one of the first underwater parks in the state. Known as Lake Tahoe's hidden castle, Vikingsholm is one of the most respected examples of Scandinavian architecture in the western hemisphere. So, how did it get there? Lovely rooms, fantastic service, but this is Lake Tahoe, so it's all about that prime, waterfront location! Why book a regular guest room when you can have a cottage? Right on the lake, surrounded by mountains. A fireplace suite with expansive views of the Sierra Nevada peaks - ahhhhh!